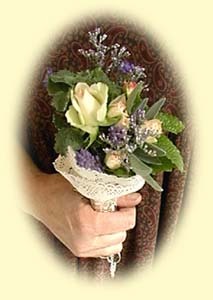 Historically, a tussie mussie was a small hand held bouquet, which combined symbolism with beautiful fresh flowers and fragrant herbs. During the Victorian Era books were published on the language of flowers. The flower offered a silent language that allowed flower lovers to communicate many sentiments that the propriety of the times would not normally allow. Listed below are some of the most commonly occurring plants and flowers given in these books. Their messages varied a little here and there with personal perspectives, but for the most part the interpretations were consistent. For more detailed information on flowers, their language and use throughout history, consult The Magic Garden by A. Mercatante and The Victorians and their Flowers by Nicollette Scourse. Arborvitae . . . . .
Artemisia . . . . . . Basil . . . . . . . . . Bittersweet . . . . .
Carnation . . . . . .
Dahlia . . . . . . . .
Fern . . . . . . . . . .
Feverfew . . . . . .
Goldenrod . . . .
Hydrangea . . . . Lavender . . . . . . Lemon balm . . .
Marigold . . . . . .
Mint . . . . . . . . .
Mugwort . . . . . .
Oregano . . . . . .
Parsley . . . . . . . .
Pokeweed . . . .
Red Rose . . . . .
Yellow Rose . . .
White Rose . . . .
Rosemary . . . . . .
Sage . . . . . . . . .
Statice . . . . . . .
Strawflower . . . .
Thyme . . . . . . . . Wheat . . . . . . . .
Yarrow . . . . . . .
Zinnia . . . . . . . .
Today the term tussie mussie is used generically to identify bouquets in cone shaped holders. The flowers may be either fresh or dried and their symbolic meaning may or may not be relevant. 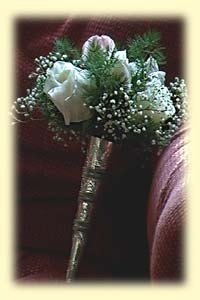 Fresh tussie mussies are a great alternative to corsages. 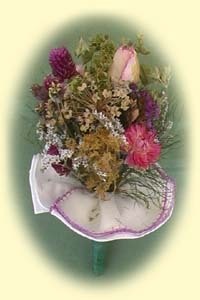 Carefully selected flowers will dry nicely and make a terrific keepsake. 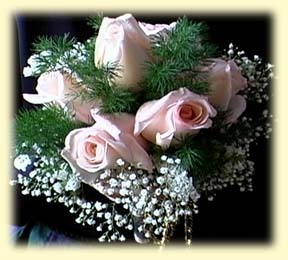 The price of a fresh tussie mussie depends on the holder and the flowers you select. For example, the two pictured here with 7 roses in each one are in the $30 to $40 range. Our dried tussie mussies, designed to hang on the wall or lay on a tabletop, incorporate one handkerchief. 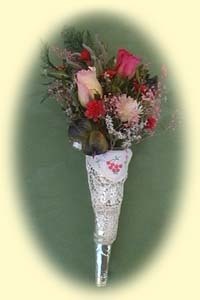 Another design uses two handkerchiefs and can be placed in a bud vase or cordial glass. No two handkerchiefs are alike and each tussie mussie we make is unique. 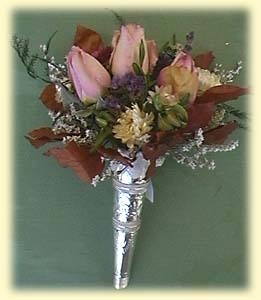 Prices range from $20 to $30 (plus shipping and handling) for a dried tussie mussie depending on your selection of holder style and flowers. 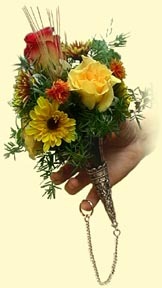 Reproduction tussie mussie holders are available to hold fresh or dried bouquets. Prices vary depending on style and whether the holder is sterling silver or silver plate. The two pictured here are $20 plus shipping and handling. Others styles are available.